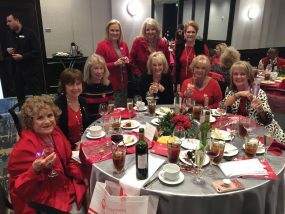 CAN IT BE 25 years since the Assistance League of the Bay Area first became a part of our lives? Four of the honorees share the spotlight as Assistance League VIP reception. They are, from left, Linda Byrd, Sharon Dillard, Mary Alys Cherry and Melinda Marcum. Seems like just yesterday they began helping both needy children and students at risk of dropping out of school, visiting with the elderly and brightening up everyone’s life with proceeds from their benefit galas. Remember the Ball of the Wild when doctors and lawyers dressed up as bunnies, bumble bees and cavemen? This gala was black-tie, but you should have seen the crowd doing The Twist to the song Shout. President Kim Barker, who came with her husband, Dave, and President-elect Brunella Altemus brought many of their memories back to life during their “Star Studded Evening” at the Marriott while honoring the 14 founding members – Atiya Abouleish, Linda Byrd, Ebby Creden, Sharon Dillard, Cathy Giesinger, Elizabeth Glenn, Leslie Huff, Faye Kidder, Jeana Magness, Melinda Marcum, Cathy McDaniel, Jan Parks, Barbara Rosenthal and Charlotte Teeter – by presenting the “Super Stars” with certificates and flowers. League member Georgia Piwonka was presented the Ada Edwards Laughlin Award, while Bay Area Houston Magazine Publisher Mary Alys Cherry was the recipient of the H.O.P.E. Award and Jill’s Fashions and Bridals was given the Glass Slipper Award. Joining them in recapping the past was Jenny Verghese, who put hundreds of photos together to go with Jill Smitherman’s brief history of what has become one of the Bay Area’s premier organizations. Gala Chairman Kathleen Courville and her husband, Mike, and Co-Chairman Dee Cover got the party started with a VIP Reception in the hotel’s Pasadena Room, where they greeted the honorees and their husbands, including Sharon and Dr. Howard Dillard, Lynda Byrd and Melinda and Dr. Stephen Marcum before hurrying out to the ballroom to welcome the arriving crowd that included Drs. Gerry and Cindy Castille, Rick and Jill Williams Lammers, Joan and Dan Burt, Matthew and Angie Weinman and Martha and Bill Krueger. Gala Chairman Kathleen Courville, left, and Co-Chairman Dee Cover dance with the Blues Brothers as the Assistance League celebrates 25 years of lending a helping hand to the community. Wasn’t long before they were joined by Frank and Judy Law, Jennie and Rob Hampton, John and Jill Smitherman, Jerry and Peggy Clause, Cecil and Judie Ferguson, Joy and Dr. Henry Muniz, Chris and Peggy Heinrich, John and Georgia Piwonka, Renee Ditta, Sonia Walsh, Patty Hoffman, Dane and Darla McKitrick, Jay and Courtney Atchley, Richard and Traci Dvorak and Stuart and Sheryl Berg, ready to be entertained by the Blues Brothers, Phil Pampolina and the Jill Rauscher Dancers. As were John Gay and Pat Monks and their wives, Becky Reitz and Annette Dwyer, Gene Hollier and Emmeline Dodd, Anita Fogtman, John and Madeline Nugent, Mike and Kathy Reeves, Walt and Leslie Huff, Doug and Johanna Mathera, Jason and Lea Bodie, Jeff and Tricia Totten and a host of others as they enjoyed filet mignon and stuffed Creole chicken.